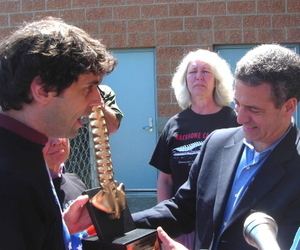 Silenced Majority Portal: Feingold Gets Backbone Award! Today I attended a most interesting event. Russ Feingold of Wisconsin was stumping for Maria Cantwell of Washington. Many who came to see Russ have mixed feelings about Cantwell who has been weak on the war though strong on the environment. Before the speeches, I noticed Bill Moyer of the Backbone Campaign heading out the door with a large gold backbone! (The Backbone Campaign is a grassroots effort to embolden citizens and elected officials to stand up for progressive values. See http://www.backbonecampaign.org) I followed him outside and he told me they had been relegated to the area near the chain link fence ("like at the convention," he said, probably because the Backbone Campaign also give "Spineless Awards"). Luckily it was the route Feingold would use to come into the school building where the event was held. It appeared that he really appreciated his Backbone and he certainly deserves it. He opposed the Patriot Act, opposed the Iraq War, and proposed censure of Bush, before any of these positions were politically trendy or safe. I learned also that Feingold once won by 31 votes (in an even closer election than our governor, who won by 126 votes). I learned that Feingold was once endorsed by Elvis Presley. He has not taken "soft money" and has spearheaded Campaign Finance Reform. He holds the seat of Senator Gaylor Nelson, who started Earth Day. From local speakers, I learned more about my community and how to next take a direction. There is the possibility of burning shoe leather in more "purple" or "red" districts. We have those running who came from the grassroots, who left careers to help steer the country back in the right direction. "Those who deny freedom to others deserve it not for themselves and can not under God retain it."